Sarah studied Medicine at the Royal Free and University College Hospital, during which time she undertook a BSc degree in infectious disease, before attaining membership of the Royal College of Physicians in 2006. She trained in Radiology at the Norwich Radiology Academy, after which time she completed a Fellowship in Musculoskeletal Imaging at the Nuffield Orthopaedic Hospital, Oxford. 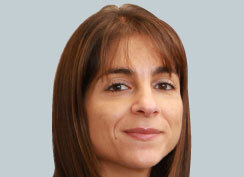 She was appointed to Buckinghamshire Healthcare NHS Trust in 2011 where she leads the MSK service. She is Clinical Tutor for the Oxford Deanaery. She has an interest in education and research, teaching on several regional courses and has published several musculoskeletal papers in peer-review journals as well as reviews and book chapters.